Our list is a buyer's list. 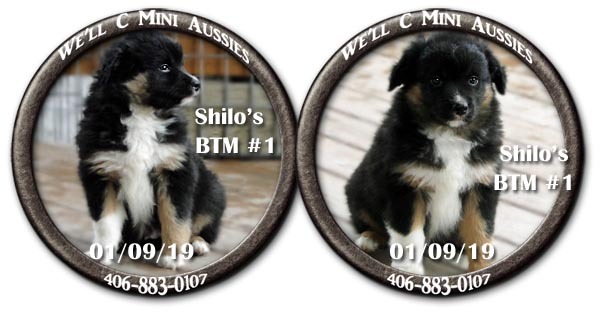 We will add you after you make a down payment for one of our Mini Aussie puppies. We secure puppies by first payment received. VIEW OUR CURRENT LIST. HC (Hereditary Cataracts), CD (Cone Degeneration), PRA/PRCD (Progressive Retinal Athrophy and Progressive Rod-Cone Degeneration), and CEA (Collie Eye Anomily). Shilo and Morgan have a new little Mini Aussie puppy born November 20, 2018. There was only one little boy born. He can go home on January 15, 2019. SOLD ~ This sweet baby is going home with Pam. CLICK ON THIS PAYPAL LOGO TO GET TO THE SELECTION FORM. MAKE SURE TO FILL IN ALL 6 LINES OR THE FORM WILL DISPLAY AN ERROR MESSAGE.